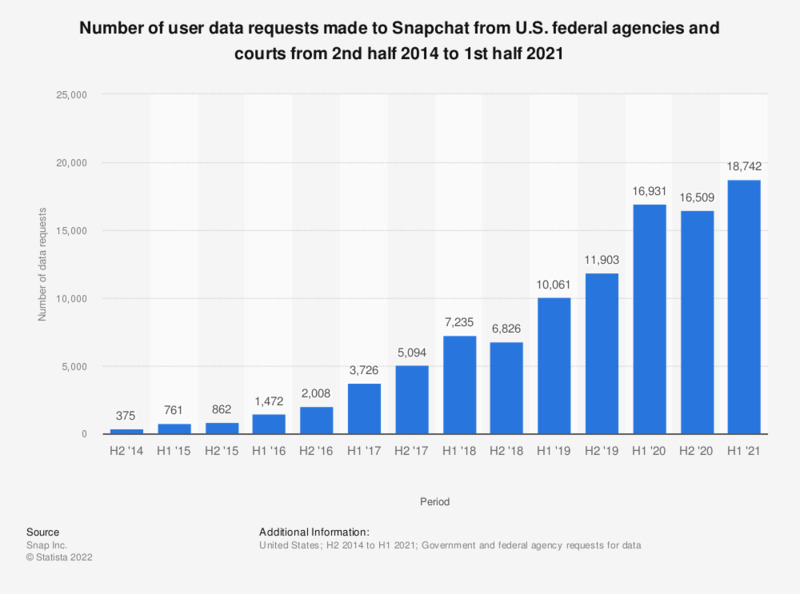 This statistic shows the number of user data requests Snapchat received from federal agencies and courts in the United States from 2014 to 2017, sorted by the respective six-month period in which the requests were published. The photo sharing and chat app received 5,094 user data requests from the United States' federal authorities during the second half of 2017. The table below provides the number of government requests for user data from the United States issued by U.S. authorities for U.S. criminal investigations as well as requests made on behalf of other governments pursuant to mutual legal assistance treaties and other diplomatic mechanisms. Do you share your pictures from holidays on Snapchat? Do you use Snapchat to follow fashion brands and/or retailers? Do you share your vacation photos on Snapchat?